Teri Ray is a lifetime resident of Hubbard, Ohio. She attended Hubbard Schools graduating high school in 1980. After graduating, she attended Lewis-Weinberger School of Cosmetology and holds a license in the state of Ohio as a Managing Cosmetologist. Teri worked for 30 years as a division manager for Fiesta Salons. She joined St. Patrick Parish through RCIA at the Easter Vigil in 2002. 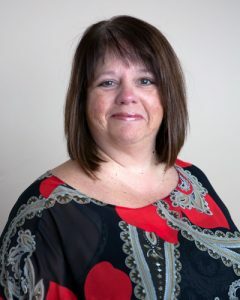 After several years of volunteering as an adult advisor for Celebrate at St. Patrick Church, in February of 2007 she accepted a position here as Celebrate Coordinator and Office Administrative Assistant. Teri was married to Leonard Ray in May of 1994. She feels blessed to serve in many ministries here at St. Patrick Parish.